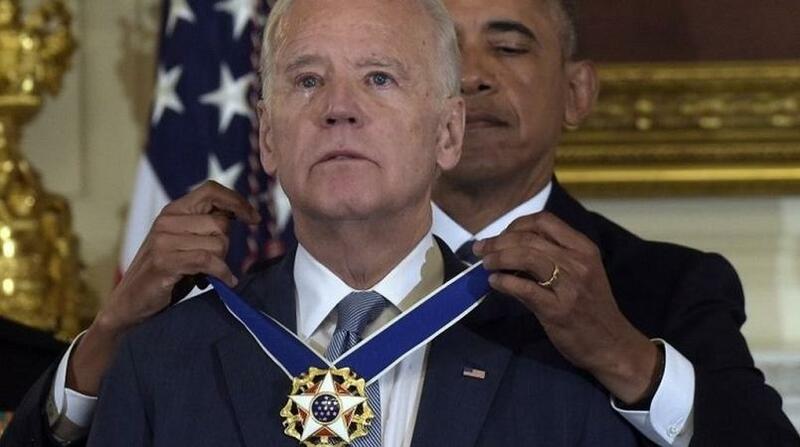 A visibly emotional Joe Biden stood by as Mr Obama heaped praise on what he called the "best possible choice, not just for me, but for the American people". The medal was awarded with distinction, according to the New York Times. That additional honour has been reserved in recent administrations for just a handful of recipients, including Pope John Paul II. He said that he had had no idea the award was coming. "I had no inkling. I thought we were coming over to Michelle for you, Jill and Barack and I and a couple of senior staff to toast one another and say what an incredible journey it's been. "Mr President, you got right the part about my leaning on Jill but I've also leaned on you and a lot of people in this room. Mr Biden has said he plans to work on policy issues at institutes at the University of Delaware and University of Pennsylvania, and continue his efforts tackling cancer, which claimed his son Beau in 2015. Mr Biden gave an hour-long interview with media outlets on Thursday in which he strongly criticised Mr Trump for his condemnation of the US intelligence services.